Annie Morrad is a London-based artist and musician and senior lecturer at the University of Lincoln, UK. Dr Ian McArthur is a Sydney-based hybrid practitioner, working in the domains of interdisciplinary design and sound art. These two musicians work together in a telematic digital structure formed from open source and proprietary software platforms. London (continuous), Sydney (various months), Chongqing (various months), New York (via monthly Wave Farm Radio broadcast). 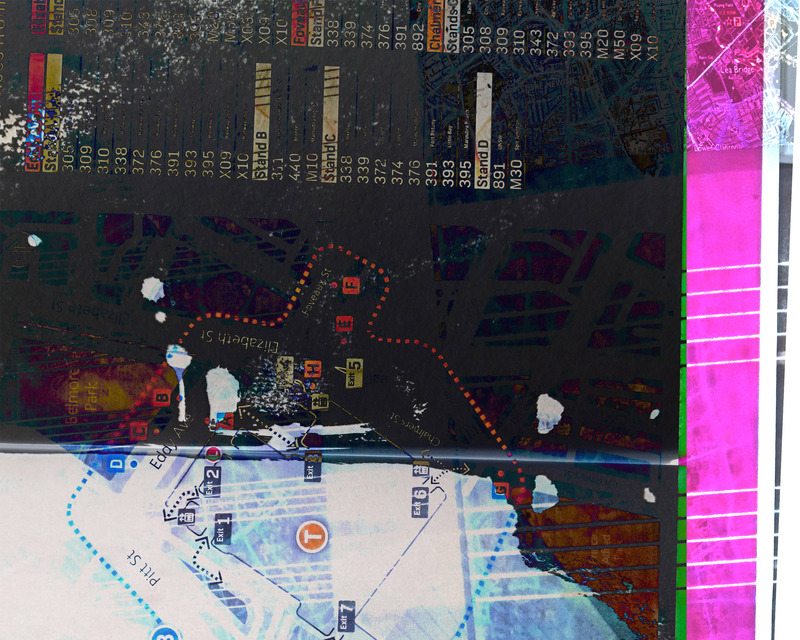 describe these cities through a juxtaposition of sonic interpretations of the grid. interpose experimental and interpreted grid structures on the selected cities (chosen for their connection to the artists). generate composed and improvised sonic structures that offer potential for new performative and participatory forms of urban sound and musicality drawing on philosophical and theoretical ideas of rhythm through polyrhythms and view of society, rhythm (Lefebvre, 2004) and social space (Lefebvre, 1991) together with the understanding of ‘time’ as instantaneous moments (Bachelard, 2000). weave interpretive and intersectional structures that break these structures using music theory influenced by Prevost’s notion of the “search for sound” to challenge accepted notions of latency held by performance artists working in distributed and networked contexts (Pévost, 1995). produce collaborative improvised and site-specific performances, experimental radio broadcasts, an interactive/responsive installation, comprised of sound, video, photographic and drawn material. develop and apply site-specific strategies to each city (1) London via ordinance survey maps and staves) (2) Sydney via structured sound, drones, (3) Chongqing via participatory urban media design and New York via our monthly live improvisation and experimental radio broadcasts (Wave Farm Radio: Morrad+McArthur https://wavefarm.org/ta/artists/x8grjs). The sonic, performative, and musical improvisations produced in “The Grid” by Morrad+McArthur address questions in the discourse of telematics and live performance and the challenge latency presents to performers working in distributed and networked contexts. Although the focus of the work is the nature of telematic improvisation and not the “glitch” itself, inevitably, interference, frozen screens, delays, echoes repeating back and environmental sound sent from the original source are typically seen as negative elements of the listening experience. However, in the live improvisations of telematic (Oliveros,) collaborators Morrad+Mcarthur these otherwise undesirable and unpredictable ‘accidents’ and interruptions are all utilised. In doing so the work reformulates accepted approaches to musical and performative creativity in telematic communication and artistic contexts. This collaboration rethinks improvisation as an emergent networked, telematic art practice, simultaneously leveraging traditions of instrumentation (eg. sax, piano) but embracing generative and digital networks to forge a new globally dispersed affect. 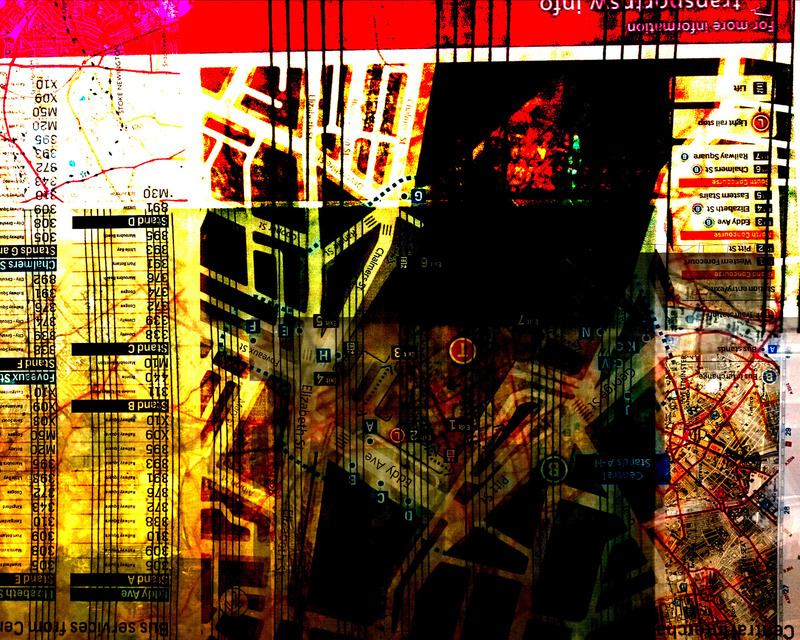 The study tests the theoretical assumption that artists working in diverse global cities brought together in a distributed digital space via simple accessible technologies, can produce a new, textural, transcultural, sonic language through a combination of disruption, composed, improvised, recorded and broadcast sounds augmented with imagery. The study will demonstrate how this dynamic real time interaction can emerge from collective, collaborative engagement in a complex weaving of sound, urban environments, new technologies, and performance when investigated within the context of regular experimental radio broadcasts, installations and performances, and participatory workshops conducted “in-the wild”, in the form of a program of experimental explorations presented simultaneously from diverse networked global urban sites. The use of the grid in the title of this proposal refers to the underlying structures of audio software and its inherent timelines, the layout of cities and urban and spaces (particularly in London, Sydney and New York, and the role of hierarchy, arrangement, and structure in visual communications. In the context of this project ‘the grid’ should not be construed as pertaining to the nodal, networked relationships and vectors of the distributed sites across which the work connects and manifests. The significance of this research is its’ contribution to knowledge about distributed, networked, and participative performance practice and the positive deployment of interruptive processes that examine and exploit its virtues to expose productive insights that go beyond abstract theorization (Campbell, 2016). The applied practice-led nature of this research reveals the relevance of the networked sonic realm to a wider interdisciplinary context where our respective and different creative practices reveal trajectories that link public art, experimental radio, architecture, urban mapping, digital design, and visual art. “The Grid” utilises experimental approaches to investigating creative engagement with notions of underlying grids, generative sound, music, improvisation, and cities. The method of practice-led research applied within this study interposes grid structures on (1) London: via an ordinance survey map with an overlaid hand drawn stave creating a ‘music’ score based on various intersections. 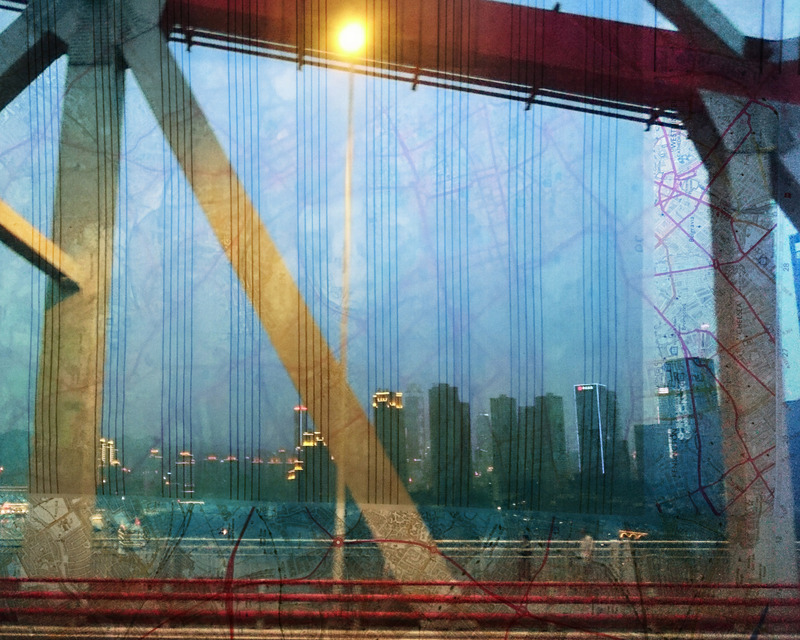 This includes the boroughs of Hackney, Camden and Islington, also providing images still and moving from which to generate a video; (2) on Sydney via structured sound drones rendered in open source and proprietary software platforms where underpinning time-based grids predominate and influence perceptions of time and modes of composition; (3) Chongqing, China via field recordings where the grid is implied through duration; and (4) on NYC via live improvisation, on Wave Farm Radio, where the durational format using an interwoven network of noise, saxophones (alto, tenor and soprano), creates structures that offer pretention for new and efferent forms of sound. Although NYC is not visited physically in this work, this is the location where the sound elements are presented either with live improvisation or pre-recorded. Should this project be chosen, a dedicated piece will be devised and performed at the Project Anywhere conference in November 2018. This methodology draws on philosophical and theoretical ideas on rhythm structures that include polyrhythms (Coleman, 2010), Lefebvre’s society and rhythm (Lefebvre, 2004), and the understanding of ‘time’ as instantaneous moments (Bachelard, 2000). This facilitates performative, ‘liveness’ (Auslander, 2008), and experiential (Merleau-Ponty, 2002) improvised practice that is based within an understanding of ‘western music theory’. The initial concept and idea are the main focus; the practice within western music theory is disregarded (Prévost, 1995) when it is felt that ‘sound’, incorporating field recordings (Demers, 2010) or noise (Thompson, 2017) reflects and relates to the city in a more creative or conversant way. This is informed by its embrace of defective elements; some of which arise through playing live saxophone, the use of deficient internet connections, software that changes patterns, and the playing location, that provide effective responses. This project interweaves sounds that are located or inspired from the three main cities, London, Sydney and Chongqing. The aim is to produce a number of sound pieces that utilise diverse sounds from different disciplines, including field recordings, noise, traditional music theory, improvisation, (Peters, 2011) (Bailey, 1992) (Toop, 2016), the digital and electronic. This is to create soundscapes that explore ‘the city’ from two practitioners who live at opposite ends of the planet, only producing work via a digital space. Live and recorded outputs documenting the research outputs will be regularly broadcast on ‘Itinerant Mind’ our long-standing monthly experimental radio broadcast on Wave Farm 90.7 FM New York. In addition to co-work either through file sharing or live improvisations performed and played each month on NYC’s Wave Farm Radio station: https://wavefarm.org/ta/artists/x8grjs will be published through blogs, social media, and online links to repositories at the University of New South Wales, Australia and the University of Lincoln, UK. Students from these universities will be invited to contribute to the blogs, sound and image gathering. In particular, fieldwork in Chongqing (2018) involving art, design, computational design and architecture students in collaborative experimental urban and mapping studies (cf. mad.lab https://vimeo.com/190416240) will generate and exhibit research outcomes related to the participatory components of this experimental study. “Resounding Chongqing”,a participatory sound-mapping workshop at mad.lab 2018 at Sichuan Fine Arts Institute (Chongqing). Research Impact: The impact of this research is demonstrated in live and recorded outputs documenting the research outputs regularly broadcast on ‘Itinerant Mind’ our long-standing monthly experimental radio broadcast on Wave Farm 90.7 FM New York. Impact is further demonstrated in the installations of the research outputs exhibited in “Documents, Alternatives” the touring group exhibition and curatorial project at Airspace Gallery (Stoke on Trent): 17 November – 16 December 2017, The Verge Gallery (Sydney): 18 January – 24 February 2018, and BSAD Gallery (Bath Spa University): 20 April – 11 May 2018. The Grid has been instrumental in informing the development of “Shadowed”, a collection of recordings of improvisations that seek to reformulate accepted approaches to musical and performative creativity by investigating questions about the challenge latency presents to performers working in distributed and networked contexts within the discourse of telematics. The impact of this research output is demonstrated in its inclusion at number five within top ten listings in Jazzwise Magazine (February 2019), the UK’s biggest selling jazz monthly and the leading English language jazz magazine in Europe. Toynbee Studios, 28 Commercial Street, London t E1 6AB.